The Goodyear Tire Company's airship history begins in the early 20s? with the Zeppelin-Goodyear company, which built the large rigids Akron and Macon for the the U.S. Navy. 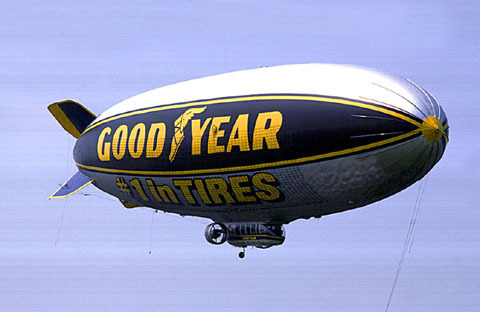 But Goodyear's legendary reputation in lighter-than-air stems from the construction of hundreds of blimps for the U.S. Navy, which were used to protect allied vessels from attack by German submarines during WWII. (To learn more about Goodyear military blimps see the US Navy Airship Picture Book.) Goodyear also pionnered the use of advertising blimps. In 1925, the "Pilgrim" was the first Goodyear blimp to fly a civil advertising mission. Since that time the company has maintained a blimp fleet ranging from as little as one? to seven airships today. It is noteworthy that Goodyear has not had a single fatal accident in civil operations during its 80 plus years of airship activities. Today, Goodyear's airship activity is limited to an extensive blimp advertising program that spans three continents. During the 1980s, while the US Navy was considering the re-introcution of airships into its program, the Loral Coporation bought the rights to all of Goodyear Aerospace's airship designs. When the US Navy canceled the airship research program in 1992?, Loral lost interest. The type-certificates for the GZ-20 and GZ-22 designs were then sold to Lockheed-Martin, which still holds them as of November 1998. The Goodyear GZ-22 Spirit of Akron, based at Wingfoot Lake near Akron, Ohio. Today, the only "real" Goodyear blimps are the three advertising blimps operated by the company in the United States. The other four, two in South America and two in Europe, are built by the American Blimp Corporation and operated by the Lightship Group. The "Spirit of Akron", of the newer GZ-22 design, was built and first flown in 1987 and is based at the original Wingfoot Lake airship base near Akron, Ohio. The other two US ships, the "Eagle" and the "Stars & Stripes", of the GZ-20 type and basically refurbished K-Class models from WWII, are based in Carson, California and in Pompano Beach, Florida respectivley. As of late 1998, Goodyear has also contracted a Lindstrand thermal airship in Mexico, a Lightship A-60+ "Spirit of the Americas" in Brazil, and two Lightships, named "Spirit of Europe One" and "Two" respectively, on European territory. For further information please visit the official Goodyear Blimp website.